Plasmacytoid dendritic cells (pDCs) play essential roles in directing immune responses. These cells may be particularly important in determining the nature of immune responses to viral infections in patients with allergic asthma as well those with other atopic diseases. The purposes of this study were 1) to compare the functional capacity of pDCs in patients with one type of allergic disorder, allergic asthma, and controls; 2) to determine whether IgE cross-linking affects antiviral responses of influenza-exposed pDCs; and 3) to determine whether evidence of counterregulation of FcεRIα and IFN-α pathways exists in these cells. pDC function was assessed in a subset of asthma patients and in controls by measuring IFN-α production after exposure of purified pDCs to influenza viruses. FcεRIα expression on pDCs was determined by flow cytometry in blood samples from patients with allergic asthma and controls. pDCs from patients with asthma secreted significantly less IFN-α upon exposure to influenza A (572 versus 2815; p = 0.03), and secretion was inversely correlated with serum IgE levels. Moreover, IgE cross-linking prior to viral challenge resulted in 1) abrogation of the influenza-induced pDC IFN-α response; 2) diminished influenza and gardiquimod-induced TLR-7 upregulation in pDCs; and 3) interruption of influenza-induced upregulation of pDC maturation/costimulatory molecules. In addition, exposure to influenza and gardiquimod resulted in upregulation of TLR-7, with concomitant downregulation of FcεRIα expression in pDCs. These data suggest that counterregulation of FcεRI and TLR-7 pathways exists in pDCs, and that IgE cross-linking impairs pDC antiviral responses. The pathogenesis of asthma is multifactorial, with both genetic and environmental factors contributing to disease severity (1). Respiratory viral infections are common precipitants of asthma exacerbations (2, 3). Although the mechanisms for this remain undefined, they may involve an inability of asthmatic individuals to generate adequate type I IFN responses during viral infection. Supporting evidence comes from in vitro studies demonstrating diminished viral-induced IFN-α responses in whole-blood cultures from asthmatic and atopic individuals (4, 5). The nature of the cells responsible for this reduced synthesis of IFN-α in patients with allergic asthma and atopy remains undefined. Although multiple studies suggest potential roles for dendritic cells (DCs) in the pathogenesis of allergic diseases, such as asthma and atopy (6–10), a definitive link between diminished antiviral responses and DCs in patients with these diagnoses has not yet been established. Two subsets of blood DCs, plasmacytoid DCs (pDCs) and myeloid DCs, have been well characterized (11), and both are recruited to the respiratory tract in children with acute viral infections (10, 11). A critical role of pDCs involves the rapid production of massive amounts of type I IFN in response to viruses (12, 13). This IFN-α secreted by mature pDCs licenses them to drive potent Th1 polarization of CD4 T lymphocytes in vitro (14). In addition to their capacity to produce large concentrations of type I IFN, pDCs express FcεRIα, the high-affinity receptor for IgE (15–17). These cells have thus been implicated in allergic diseases, including allergic asthma and atopic dermatitis (10, 18, 19). In support of this notion, patients with allergic asthma exhibit increased FcεRIα expression on pDCs compared with nonallergic controls (9, 15, 20). This increased FcεRIα expression on DCs serves to enhance the presentation of allergen to T lymphocytes (21), thus affecting Th2 polarization of allergen-specific immune responses. In addition to FcεRIα, pDCs also express the pathogen recognition receptors TLR-7 and TLR-9, which recognize single-stranded RNA and unmethylated CpG motifs, respectively (13, 22). As stated by Schroeder and colleagues (23), it seems curious that pDCs coexpress receptors (i.e., TLR-9 and FcεRIα) with such opposing functions. Interestingly, this group found that FcεRIα and TLR-9–mediated responses actually oppose one another in pDCs by downregulating one another’s expression. More specifically, IgE cross-linking on pDCs resulted in markedly reduced TLR-9 expression and oligodeoxynucleotide containing unmethylated CpG motifs (CpG-ODN)–induced IFN-α secretion. Conversely, TLR-9 ligation with CpG-ODN resulted in a significant decrease in FcεRIα expression on pDCs (23). The counterregulatory mechanisms between FcεRI expression/activation and IFN-α responses to TLR-9 agonists (i.e., CpG-ODN) in pDCs demonstrated by Schroeder and colleagues (23) led us to ask similar questions about how respiratory viruses affect these pathways in pDCs. Thus, our overarching goal was to determine if the allergic phenotype influences antiviral responses, using a model of allergic asthma. Because TLR-7 expressed by pDCs recognizes single-stranded RNA of common respiratory viruses like influenza (24, 25), we evaluated whether this TLR-7–induced IFN-α response following influenza exposure, like the TLR-9–mediated responses to CpG-ODN DNA, was diminished by activating the FcεRI receptor. To accomplish these goals, we focused on patients with allergic asthma and first compared influenza-induced pDC IFN-α responses in asthma patients versus controls, then evaluated the impact of IgE cross-linking/FcεRI activation on pDC antiviral IFN-α responses, TLR-7 and FcεRIα mRNA expression, and influenza-induced pDC maturation. Fifty-six participants, ages 3–35 y, living in the Dallas area were enrolled in this study. Twenty-six of the participants had allergic asthma, and 30 were in the control group. The asthma participants all had physician-diagnosed asthma, and each had a positive skin test to one or more indoor allergens. Moreover, the majority (96%) were taking a controller medication. The control patients had no history of asthma, and only one control subject reported using a medication for seasonal allergies. As shown in Table I, the majority of the patients were African American, with a mean age of 15 y in the asthma patient group and 15 y in the control population. The allergic asthma patients had significantly higher serum IgE concentrations than did the control participants (310 kU/l versus 122 kU/l; p = 0.014), and 100% of those tested were skin test positive to one or more environmental allergens. An additional eight patients with dust mite sensitivity (defined as positive skin test to Dermatophagoides pteronyssinus allergen 1 [Der p 1]) and no history of asthma, ages 9–41 y, were enrolled for the experiment displayed in Supplemental Fig. 2. This study was approved by the University of Texas Southwestern institutional review board. Written informed consent and assent were obtained. Whole blood was collected into Cyto-Chex BCT tubes (Streck, Omaha, NE) for subsequent flow cytometric analysis. For staining, 150 μl blood and 3–10 μl each Ab were incubated for 30 min. The blood was next lysed with FACS Lysing Solution (BD Biosciences, San Jose, CA), rinsed with PBS, centrifuged at 1200 rpm for 10 min, and resuspended in 1% paraformaldehyde. Samples were then acquired on a BD LSR II flow cytometer (BD Biosciences) and analyzed with FlowJo software (Tree Star, Ashland, OR). The following fluorochrome-conjugated anti-human Abs were used for identification of pDCs in whole blood: Lineage-FITC mixture (containing CD3, CD14, CD16, CD19, CD20, and CD56), CD123-PE-Cy5, HLA-DR-PerCP, CD11c-APC, CD14-Pacific Blue (BD Biosciences), and FcεR1α-PE (eBiosciences, San Diego, CA). pDCs were identified by flow cytometry, using a FACSAria (BD Biosciences), as lineage-negative, HLA-DR–positive, and CD123-positive cells. The mean fluorescence intensity (MFI) of FcεR1α expression on blood pDCs was determined by flow cytometry and subsequently converted to molecules of equivalent soluble fluorescence (MESF), using the Quantum Simply cellular kit (Bangs Laboratories, Fishers, IN) and QuickCal v.2.3 Data Analysis Program. For experiments shown in Fig. 6, the following Abs were used: CD80-FITC, CD86-PeCy5, and HLA-DR-APC Cy7, and the expression of CD80, CD86, and HLA-DR was determined by flow cytometry and reported as MFI for each marker. Whole blood was collected into Vacutainer tubes (BD Biosciences) containing no additives and centrifuged at 2500 rpm for 10 min. Serum was collected and stored at −20°C. Total IgE was measured using a fluorescent-based enzyme immunoassay that was performed on the ImmunoCAP 250 (Phadia, Kalamazoo, MI) at the Johns Hopkins University Dermatology Allergy and Clinical Immunology Reference Laboratory. In a subset of patients with asthma and controls, pDCs were purified from whole blood. Blood was drawn into tubes containing acid citrate dextrose and subsequently diluted 1:1 (vol/vol) with sterile PBS, followed by isolation of PBMCs by Ficoll-Paque (Amersham Biosciences, Uppsala, Sweden) density gradient centrifugation. pDCs were purified from the PBMCs using the Diamond pDC isolation kit (Miltenyi Biotec, Auburn, CA). This process involved both negative and positive selection steps. The positive selection step was performed with CD304 (BDCA-4/Neutropilin-1)–labeled microbeads. The purity of pDCs isolated from the samples was >95%. pDCs were cultured in 96-well plates in 0.2 ml complete RPMI 1640 media (supplemented with 10% heat-inactivated FCS, 1% penicillin-streptomycin, 1% Na pyruvate, 1% glutamate, 1% HEPES buffer solution, 1% nonessential amino acids, and 100 μM β-mercaptoethanol) at concentrations of 1.0 × 104 pDCs/0.2 ml for patient experiments in which blood volume was limited (Fig. 1) or 2 × 104 pDCs/0.2 ml for remaining experiments. IL-3 was added (10 ng/ml; R&D Systems, Minneapolis, MN) to all culture conditions to maintain the viability of pDCs. The following pDC culture variable conditions were tested in this study: influenza A (A/PR/8/34 [H1N1], multiplicity of infection of 0.5; Charles River Laboratories, Wilmington, MA), influenza B (B/Lee/40, multiplicity of infection of 0.5; Charles River Laboratories), gardiquimod (a TLR-7 agonist; Invivogen, San Diego, CA), rabbit anti-IgE or rabbit IgG (5 μg/ml; Bethyl Laboratories, Montgomery, TX), or control media. In the allergen experiments, natural Der p 1 (1–25 μg/ml; INDOOR Biotechnologies, Charlottesville, VA) and tetanus toxoid (1 μg/ml; EMD Biosciences, Gibbstown, NJ) were used. Supernatants were collected by centrifugation at 1500 rpm for 10 min and stored at −80°C. For selected experiments, pDCs were harvested for subsequent RT-PCR or for evaluation by flow cytometry. The concentration of IFN-α in pDC culture supernatants was measured by ELISA, using the Human IFN-α multisubtype ELISA kit (PBL Biomedical Laboratories, Piscataway, NJ). The 96-well plates were analyzed on ELISA reader DTX 880 Multimode detector (Beckman Coulter, Fullerton, CA), and the data were analyzed using GraphPad Prism version 5. Total RNA was extracted from 2 × 104 pDCs using RNA-Bee (Tel-test, Friendswood, TX) and chloroform. The aqueous phase was separated and precipitated using isopropanol. The pellet was washed with cold 75% ethanol, resuspended in RNA storage buffer (Ambion, Austin, TX), and stored at −80°C. The cDNA synthesis was carried using a High Capacity cDNA Reverse Transcriptase kit (Applied Biosystems, Foster City, CA). The expression of TLR-7 and FcεR1α mRNA in pDCs was quantified by performing relative RT-PCR, using a 7900HT Fast Real Time PCR system (Applied Biosystems). The sequence of TLR-7 probe/primer (TaqMan) used was as follows: probe, 5′-AGATACCGCAGGGCCTCCCGC-3′; forward primer, 5′-TTACCTGGATGGAAACCAGCTACT-3′; and reverse primer, 5′-TCAAGGCTGAGAAGCTGTAAGCTA-3′. The sequence of FcεR1α probe/primer (TaqMan) was as follows: probe 5′-TGACTGGCTGCTCCTTCAGGCCTC-3′; forward primer, 5′-GTGAACCTGTGTACCTGGAAGTCTT-3′; and reverse primer, 5′-CATCCCAGTTCCTCCAACCA-3′. The reporter dye and quencher were FAM and TAMRA, respectively. The TLR-7 and FcεR1α mRNA expression was normalized to hypoxanthine-guanine phosphoribosyltransferase mRNA (Applied Biosystems). The results were based on 2−ΔΔct values. Single-step real-time RT-PCR was performed in an ABI Prism 770 Thermocycler (Applied Biosystems), using the TaqMan reagent kit (PerkinElmer, Wellesley, MA). Data are presented as means ± SE except where otherwise noted. Statistical analyses were performed with GraphPad Prism version 5 and involved the use of Student t tests, paired t tests, and one-way ANOVA, followed by post hoc pairwise comparisons using Mann–Whitney U tests. p ≤ 0.05 was considered significant. We first compared influenza-induced responses among pDCs from allergic asthmatics and nonasthmatic controls. Upon exposure to influenza A, purified pDCs from patients with allergic asthma secreted significantly less IFN-α compared with pDCs from controls (572 versus 2815 pg/ml; p = 0.03; Fig. 1A). Influenza B exposure also resulted in trends toward less secretion of IFN-α in pDCs from allergic asthma patients compared with pDCs from controls, although the difference was not statistically significant (1865 versus 4420 pg/ml; p = 0.07; Fig. 1B). 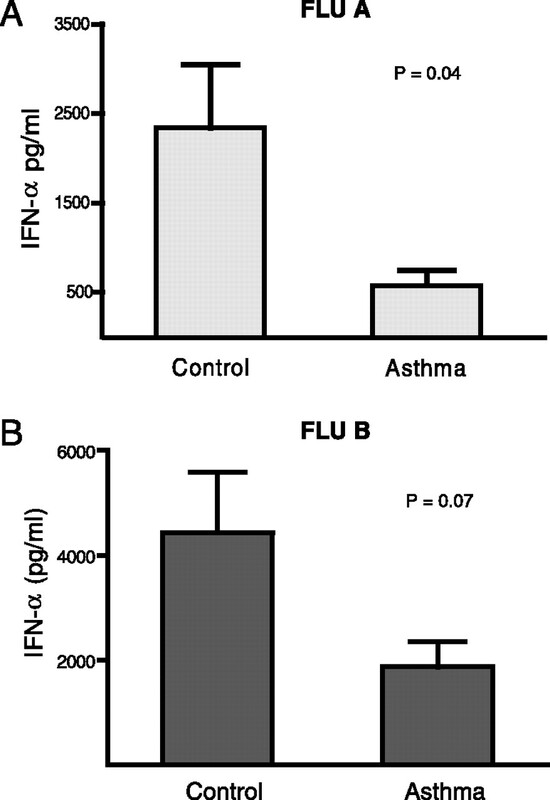 Purified pDCs from patients with allergic asthma secrete less IFN-α upon exposure to influenza viruses. Blood pDCs were isolated from patients with allergic asthma (n = 8) and controls (n = 9) and exposed to influenza A or B for 36 h. Mean (± SEM) IFN-α concentrations measured in culture supernatants are displayed in A (influenza A) and B (influenza B). Results of unpaired t tests are displayed. Several studies have documented increased FcεRIα expression on pDCs in patients with atopy and asthma (9, 15, 17). We evaluated FcεRI expression on blood pDCs in 26 patients with allergic asthma and 30 control individuals (Table I), and we too found increased FcεRIα expression on pDCs in the allergic asthma group compared with the control group (mean MESF, 21,307 versus 12,063, respectively; p = 0.001; Fig. 2A). Although our study was not powered to evaluate potential effects of race or gender on pDC FεRIα expression, higher FεRIα values were observed in the asthma population within each racial and gender subgroup (Supplemental Table I). Comparative pDC FcεRIα values expressed as MFI are shown in Supplemental Table II. Similarly, lower influenza A-induced IFN-α concentrations were observed on pDCs isolated from asthmatic individuals within the race and gender subpopulations, although the numbers within these subgroups were small. 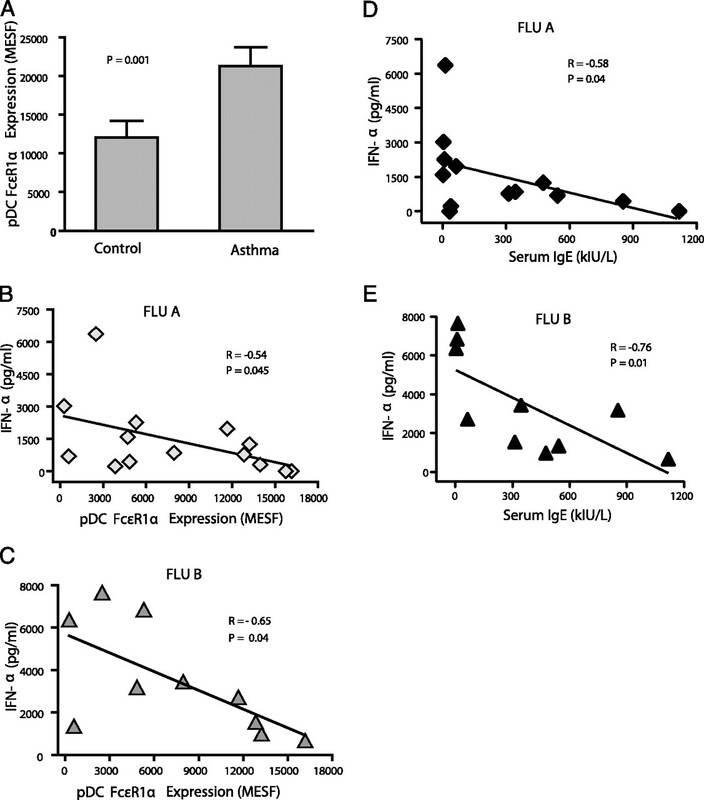 pDCs from patients with allergic asthma express increased surface FcεRIα, and this correlates inversely with influenza-induced IFN-α secretion. A, FcεRIα expression on pDCs was determined by flow cytometry (expressed as MESF) in the allergic asthma patient group and healthy control subjects. Results of t tests are displayed. Correlation between influenza A- and B-induced IFN-α release and pDC FcεRIα expression was determined (B and C, respectively). Significant inverse correlations are demonstrated for both influenza A- and influenza B-induced IFN-α secretion and pDC FcεRIα expression. Results of Pearson correlation tests are shown. 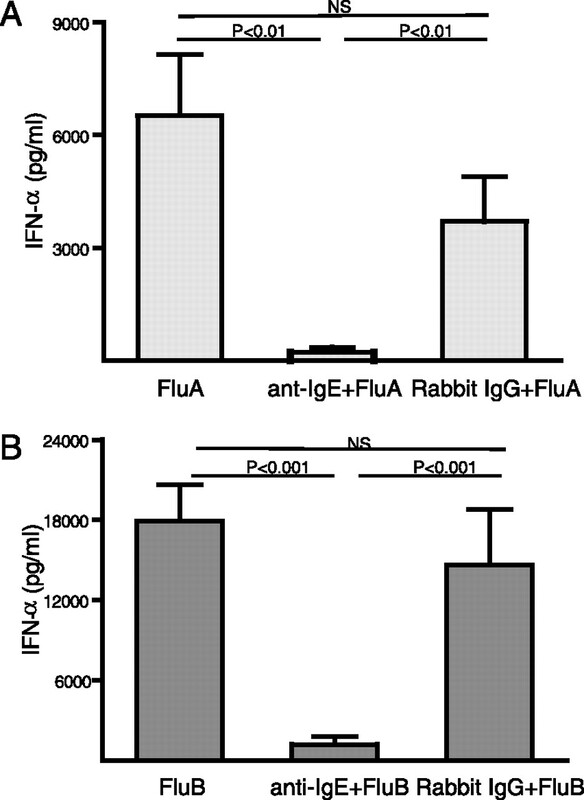 Correlation between influenza A- and B-induced IFN-α release and serum IgE concentration was determined (D and E, respectively). Significant inverse correlations are demonstrated for both influenza A- and influenza B-induced IFN-α secretion and pDC FcεRIα expression. Results of Pearson correlation tests are shown. To address whether the decreased IFN-α response of pDCs in our allergic asthma population was potentially related to their increased expression of FcεRIα, we next examined the relationship between influenza-induced IFN-α secretion and pDC FcεRIα expression. As demonstrated in Fig. 2B and 2C, there was a significant inverse correlation between the IFN-α secreted upon exposure to both influenza A and B viruses and FcεRIα expression on pDCs (R = −0.54 and −0.65 for Flu A and Flu B, respectively; p < 0.05 for both). Because FcεRIα expression is known to correlate with serum IgE concentrations, we next evaluated whether serum IgE concentration itself correlated with pDC antiviral IFN-α response in these patients. Indeed, as shown in Fig. 2D and 2E, we found a significant inverse correlation between influenza A- and B-induced pDC IFN-α secretion and serum IgE concentration (R = −0.56 and −0.76 for Flu A and Flu B, respectively; p < 0.05 for both). The inverse relationship between FcεRIα expression and the influenza-induced IFN-α response led us to investigate whether activation of the FcεRIα pathway in pDCs could interrupt their antiviral responses. We first sought to determine whether cross-linking of IgE bound to the pDC FcεRI receptor interfered with the pDC IFN-α response to influenza viruses. Purified pDCs were cultured for 18 h with influenza A or influenza B either alone or after preincubation with anti-IgE or anti-IgG, and IFN-α was measured in the supernatants. Preincubation with anti-IgE at 5 μg/ml significantly inhibited influenza-induced pDC IFN-α release, whereas preincubation with anti-IgG (as a control Ab) did not interfere with the pDC IFN-α response to influenza A (Fig. 3A) or influenza B (Fig. 3B). Although higher doses of anti-IgE (20 and 10 μg/ml) prior to influenza exposure induced a similar abrogation of IFN-α secretion, preincubation with the lower 1 μg/ml anti-IgE dose did not interfere with influenza-induced IFN-α secretion. This finding suggests that the interruption of viral-induced IFN-α secretion by IgE cross-linking is dose dependent (Supplemental Fig. 1). These data provide evidence that activation of the FcεRI on pDCs interferes with the pDC antiviral response. IgE cross-linking inhibits influenza-induced secretion of IFN-α in pDCs. Purified pDCs were cultured for 18 h with influenza A or influenza B, either alone or after preincubation with anti-IgE or rabbit IgG (as a control Ab), and IFN-α was measured in the supernatants. Data are expressed as mean ± SEM. ANOVA, p < 0.001 for A and B; results of Mann–Whitney t tests are displayed. To address the question of whether allergens could induce the same effect, we exposed purified pDCs from individuals with dust mite allergy (defined as Der p 1 skin test reactivity) to influenza virus after preincubation with purified Der p 1. As demonstrated in Supplemental Fig. 2, exposure to dust mite allergen did result in diminished influenza-induced pDC IFN-α production in a subset (5 of 8) of dust mite-sensitive individuals, although this abrogation was not as pronounced as that induced by preincubation with anti-IgE. Notably, similar experiments using pDCs from individuals without evidence of dust mite allergy revealed no interruption of the influenza-induced pDC IFN-α response. These results, although intriguing, were conducted in a small number of patients, and further experiments are thus required to determine the relationship between allergen-specific responses and pDC function. Because of the IgE cross-linking–induced diminution of the pDC IFN-α response to influenza viruses, we next investigated the effect of viral exposure on TLR-7 and FcεRIα expression. Schroeder and colleagues (23) have demonstrated a dichotomy between TLR-9–mediated responses and FcεRIα expression in human pDCs, and we considered that similar mechanisms could affect pDC responses to influenza viruses that are mediated, at least in part, through TLR-7. Purified pDCs were cultured with influenza A, influenza B, or gardiquimod, a TLR-7 agonist, and subsequently harvested for RNA extraction and quantitation of TLR-7 and FcεRIα mRNA. As demonstrated in Fig. 4A and 4B, exposure to influenza A, influenza B, and gardiquimod resulted in significant upregulation of TLR-7 mRNA with concomitant downregulation of FcεRIα mRNA. Likewise, cross-linking of IgE with anti-IgE resulted in decreased TLR-7 mRNA expression, whereas exposure to rabbit IgG, a control Ab that does not cross-link the IgE bound to FcεRIα, did not significantly affect pDC TLR-7 expression (Fig. 4C). This oppositional expression of pDC TLR-7 and FcεRIα mRNA in response to influenza viruses and gardiquimod exposure and downregulation of pDC TLR-7 expression after IgE cross-linking suggests counterregulation of these pathways in pDCs similar to the TLR-9 and FcεRIα pathway counterregulation reported by Schroeder and colleagues (23). Because many factors determine the final expression of FcεRIα, we also measured pDC surface FcεRIα levels after influenza and gardiquimod exposure. As shown in Supplemental Fig. 3, unlike FcεRI mRNA levels, surface pDC FcεRI expression measured by flow cytometry was not differentially diminished in influenza- or gardiquimod-exposed pDCs compared with control cells. Exposure to influenza viruses and gardiquimod (a TLR-7 agonist) upregulates TLR-7 expression and downregulates FcεRIα expression in pDCs. A and B, Purified pDCs were cultured for 8 h with control media, influenza A, influenza B, or gardiquimod. 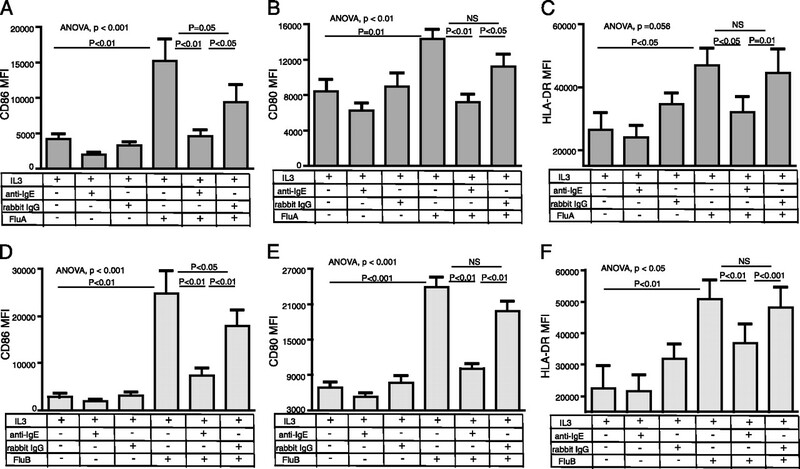 Cells were harvested for RNA extraction and subsequent quantification of TLR-7 (A) or FcεR1α (B) mRNA by real-time RT-PCR, using hypoxanthine-guanine phosphoribosyltransferase as an endogenous control. Data are expressed as the mean ± SEM percentages of control pDC 2−ΔΔct values. Results represent five individual experiments. ANOVA, p < 0.01 for A and B. The p values displayed represent paired t test results. C, Purified pDCs were cultured with anti-IgE (5 μg/ml) or rabbit IgG (5 μg/ml) for 8 h and harvested for RNA extraction. TLR-7 mRNA was quantified as above. Data are expressed as the mean ± SEM percentages of control pDC 2−ΔΔct values of three individual experiments. ANOVA, p < 0.01; displayed p values represent results of unpaired t tests. We next investigated whether activation of the FcεRIα pathway in pDCs by IgE cross-linking would interfere with the influenza and gardiquimod-induced upregulation of TLR-7 within pDCs. Purified pDCs were cultured for 8 h with influenza A, influenza B, and gardiquimod (TLR-7 agonist), either alone or after preincubation with anti-IgE or rabbit IgG. The pDCs were then harvested for RNA extraction, generation of cDNA, and quantitation of TLR-7 mRNA by RT-PCR. Results shown in Fig. 5 indicate that pDCs incubated with anti-IgE for 18 h prior to influenza and gardiquimod exposure displayed significantly diminished influenza A- (Fig. 5A), influenza B- (Fig. 5B), and gardiquimod-induced (Fig. 5C) TLR-7 expression. Preincubation with rabbit IgG did not significantly affect the TLR-7 responses to the same stimuli. These results, like those shown in Figs. 3 and 4, indicate that IgE cross-linking interferes with the antiviral response in human pDCs, and that this effect is mediated at least partially through TLR-7. IgE cross-linking interferes with influenza- and gardiquimod-induced expression of TLR-7 in pDCs. A–C, Purified pDCs were cultured for 8 h with influenza A (A), influenza B (B), or gardiquimod (C), either alone or after preincubation with anti-IgE (5 μg/ml) or rabbit IgG (5 μg/ml). Cells were harvested for RNA extraction, generation of cDNA, and quantification of TLR-7 mRNA by RT-PCR. Hypoxanthine-guanine phosphoribosyltransferase was used as an endogenous control. Data are expressed as the mean ± SEM percentages of (A) influenza A-, (B) influenza B-, or (C) gardiquimod-stimulated pDC 2−ΔΔct values. Results represent seven individual experiments. ANOVA, p < 0.01 for A–C. Displayed p values represent Mann–Whitney t test results. DCs affect developing immune responses via many mechanisms in addition to the secretion of IFN-α. Initiating primary T lymphocyte responses represents a major role of pDCs; this role is mediated in part by the expression of pDC MHC proteins and costimulatory molecules. After demonstrating that IgE cross-linking interfered with the capacity of viral-exposed pDCs to secrete IFN-α and upregulate TLR-7, we next investigated whether IgE cross-linking hindered maturation of pDCs in terms of the viral-induced upregulation of surface proteins needed to direct T lymphocyte responses. To this end, purified pDCs were cultured for 48 h with IL-3 alone (control), anti-IgE, rabbit IgG, influenza A, or influenza B virus, either alone or after preincubation with anti-IgE or rabbit IgG. The pDCs were then harvested, stained with fluorochrome-labeled Abs, and analyzed by flow cytometry for the following maturation markers shown in Fig. 6: CD86 (Fig. 6A, 6D), CD80 (Fig. 6B, 6E), and HLA-DR (Fig. 6C, 6F). Exposure of pDCs to influenza A and B viruses resulted in significant upregulation of surface CD86 (Fig. 6A and 6D, respectively), CD80 (Fig. 6B and 6E, respectively), and HLA-DR (Fig. 6C and 6F, respectively). Interference with influenza-induced upregulation of these critical maturation markers was demonstrated with IgE cross-linking. Although pDCs incubated with anti-IgE prior to influenza exposure displayed diminished CD86, CD80, and HLA-DR responses to influenza A, upregulation of surface CD80 and HLA-DR was not significantly interrupted by preincubation with rabbit IgG, and upregulation of CD86 was only partially interrupted by pretreatment with rabbit IgG (but not as diminished as the anti-IgE pretreatment groups). Similar findings were seen with influenza B and are displayed in Fig. 6D–F. These results, like those shown in the previous figures, indicate that IgE cross-linking interferes with antiviral responses in human pDCs, suggesting that IgE cross-linking on pDCs may negatively affect the capacity of these cells to induce primary T lymphocyte responses. IgE cross-linking interferes with influenza-induced maturation of pDCs. A–C, Purified pDCs were cultured for 48 h with IL-3 alone (control), anti-IgE (5 μg/ml), rabbit IgG (5 μg/ml), or influenza A virus alone or after preincubation with anti-IgE or rabbit IgG. Cells were harvested, stained with CD86 PE-Cy5, CD80 FITC, and HLA-DR APC-Cy7 Abs, and the MFI of CD86 (A), CD80 (B), and HLA-DR (C) was measured by flow cytometry. Data are expressed as the mean ± SEM MFI values for displayed markers. Results of three individual experiments are displayed. Displayed p values represent results of paired t tests. Similar results for influenza B experiments are displayed in D–F. Data are expressed as the mean ± SEM. Viral respiratory infections are a particularly important precipitant of wheezing illness in children with asthma (1–3, 26). The mechanism or mechanisms by which viruses exacerbate asthma is unknown. In this study, we demonstrate reduced expression of IFN-α after exposure of pDCs to influenza virus. Our findings further demonstrate that the degree of diminished IFN-α release by pDCs is inversely correlated with both their expression of the FcεRI and serum levels of IgE, two conditions commonly found in patients with allergic asthma. These findings suggest that individuals with elevated serum IgE concentrations and increased pDC FcεRI expression may be particularly susceptible to inhibition of viral-induced pDC IFN-α release. Inhibition of this component of the antiviral response may represent one potential mechanism by which viral infections precipitate exacerbations in patients with asthma. Like the dichotomy between TLR-9–mediated responses and FcεRIα expression demonstrated by Schroeder and colleagues (23), the inverse relationship we found between influenza-induced IFN-α secretion and pDC FcεRIα expression (Fig. 2) and the finding that IgE cross-linking on pDCs interrupts influenza-induced IFN-α production (Fig. 3) suggest that similar counterregulatory mechanisms exist between the FcεRIα pathway and antiviral responses in pDCs. To explore a possible mechanism, we investigated whether TLR-7 and FcεRI exhibit cross-inhibition, similar to that shown for FcεRI and TLR-9 expression (23). Indeed, our findings indicate that reciprocal inhibition of TLR-7 and FcεRI expression occurs in pDCs by stimulation of either pathway. More specifically, we found that the upregulation of pDC TLR-7 by influenza is accompanied by a concomitant decrease in pDC FcεRIα mRNA expression. In addition, IgE cross-linking resulted in decreased pDC TLR-7 mRNA expression at baseline (Fig. 4). Because pDCs recognize influenza and other single-stranded RNA viruses via TLR-7, these findings suggest that activation of TLR-7 or a component of the TLR-7 pathway may inhibit the expression of FcεRI, similar to the counterregulation demonstrated between TLR-9 and FcεRI expression by Schroeder and colleagues (23). Interestingly, influenza B induced greater pDC IFN-α production (Fig. 3) and TLR-7 mRNA upregulation (Fig. 4A) than did influenza A, suggesting that influenza B induces a more robust activation of pDCs. Although the reasons underlying these differences are unknown, it is noteworthy that the reduction in pDC FcεRI mRNA expression induced by these two viruses was similar (Fig. 4B). Similarly, the inhibitory effect of IgE cross-linking on influenza-induced pDC IFN-α responses did not differ between the two viruses (Fig. 3). It is important to note that we demonstrated reciprocal inhibition at the mRNA level only. Although we found significant inhibitory effects of the influenza/TLR-7 agonist on pDC FcεRIα mRNA expression, we were unable to detect differences in surface FcεRIα receptor expression (Supplemental Fig. 3). One potential explanation is that viral/TLR-7 stimulation affects FcεRI expression only at the transcriptional level in pDCs and that cell surface expression itself remains unaltered by these conditions at the time point we evaluated. Alternatively, the absence of exogenous IgE (known to stabilize FcεRI receptor expression) in our culture system may have resulted in diminished surface FcεRI receptor expression in all of the pDC conditions (control and viral/TLR-7 stimulated), thus masking detection of potential differences between conditions. In summary, these data highlight the complexity of dissecting the points at which such viral-induced and allergic-associated pathways intersect in pDCs. Our results provide additional evidence that counterregulation between the adaptive and innate immune responses may occur at the level of the pDC. Because individuals with allergic asthma are known to have increased expression of FcεRI on a variety of cell types, including pDCs, our findings suggest that activation of FcεRI in vivo may result in reduced TLR-7–related recognition of or response to influenza virus. This may in turn lead to a reduced or delayed IFN-α response to infection with influenza and perhaps other similar viruses, and conceivably to enhanced disease in individuals with allergic asthma. Our findings extend those of previous studies (4, 5) demonstrating diminished IFN-α response to viral stimulation in patients with allergic asthma. Because these earlier studies were performed using whole-blood cultures, the specific cell type responsible for this decreased IFN-α release upon viral challenge was not addressed. Our present study extends these important observations by demonstrating diminished viral-induced IFN-α release from purified pDCs in patients with allergic asthma. In a recent study by Tversky et al. (19), purified pDCs from allergic subjects were found to have impaired capacity to produce IFN-α when stimulated with CpG-ODN, an agonist that acts through TLR-9. We report similar findings in purified pDCs isolated from subjects with allergic asthma but stimulated instead with influenza virus, a TLR-7–mediated event in pDCs (25, 27). The present study contributes to the growing body of knowledge about the counterregulation between FcεRI and IFN-α pathways in human pDCs and is the first to demonstrate that clinically relevant respiratory viruses like influenza can differentially affect FcεRI and TLR-7 expression in these cells. IFN-α exerts a multitude of effects on the immune system, including the skewing of T lymphocyte responses toward a Th1 phenotype. Thus, the decreased IFN-α secreted by influenza-exposed pDCs from patients with allergic asthma could result in altered T lymphocyte responses that are balanced more toward Th2 responses. In addition to their secretion of IFN-α, pDCs also direct T lymphocyte responses through direct contact with these cells via their expression of cell surface molecules and Ags. Upon viral encounter, pDCs undergo a process of maturation, resulting in the upregulation of such surface molecules as MHC class I and II and the costimulatory molecules CD80 and CD86 (11, 28), enabling them to more efficiently stimulate and direct T lymphocyte responses. The IgE cross-linking–mediated interference with influenza-induced maturation of pDCs shown in our study (Fig. 6) suggests that activation of the FcεRIα pathway in pDCs may also interfere with the capacity of viral-exposed pDCs to stimulate T lymphocytes directly and thus initiate primary antiviral T cell responses. This possible skewing away from antiviral Th1 responses toward Th2 responses associated with allergy could also contribute to the enhanced expression of asthma following infection with influenza and perhaps other viruses. The mechanism responsible for decreased influenza-induced pDC IFN-α production in patients with allergic asthma was not clearly defined by our study. Cross-linking of IgE on pDCs led to downregulation of TLR-7, thereby offering one explanation. Recent evidence suggests that the defect may actually lie in important signaling events mediated by ILT7, a member of the Ig-like transcripts (ILT) gene family that is preferentially expressed by pDCs (19, 29). ILT7 and FcεRIγ form a receptor complex that transduces ITAM-mediated signals that lead to downregulation of TLR-mediated type 1 IFN production (30). Moreover, both TLR-7 (influenza virus)– and TLR-9 (CpG-ODN)–mediated type I IFN responses are affected by ILT7 cross-linking (30). This observation suggests that ILT7 cross-linking may play a role in the inhibition of both TLR-7– and TLR-9–related IFN-α production in subjects with elevated pDC FcεRIα expression. It is important to consider that the decreased viral-induced pDC IFN-α production demonstrated in patients with allergic asthma may be related to the elevated serum IgE concentration within the allergic asthma group (Table I), not to the asthma phenotype. Indeed, both pDC FcεRIα expression and serum IgE concentrations were inversely correlated with influenza-induced pDC IFN-α production in our study (Fig. 2B–E), suggesting that this elevated IgE may affect pDC antiviral IFN-α responses in additional allergic diseases associated with elevated serum IgE concentrations. This possibility is being further explored. Our study extends our knowledge about the relationship between the allergic phenotype and viral disease. However, it does not address such critical questions as the order in which these events may occur in vivo. That is, does repeated allergen exposure in early life result in activation of the FcεRIα pathway in pDCs with ILT7 cross-linking and subsequent impaired IFN-α production? If this indeed occurs, this defect in IFN-α production may culminate in the generation of a Th2-biased immune response. Alternatively, the atopic phenotype may develop first in life, and this phenotype, along with its associated immune mediators, may subsequently lead to suppression of IFN-α responses in pDCs (23). It is hoped that longitudinal studies in large birth cohorts will dissect and answer these important questions. We thank Jordan Teeple, Rebecca Hardy, Daysha Crain, and Dolores Santoyo for assistance with patient enrollment and data collection. This work was supported by grants from Exxon Mobil Corporation (to M.G. and R.G.) and the National Institutes of Health, National Institute of Allergy and Infectious Diseases (no. 5 RO1 AI049570, to R.G.).
. 2003. Mechanisms of asthma. J. Allergy Clin. Immunol. 111: S799–804. 2003. Mechanisms of virus-induced asthma. J. Pediatr. 142: S9–13; discussion S13–14.
. 2005. Effects of viral respiratory infections on lung development and childhood asthma. J. Allergy Clin. Immunol. 115: 668–674, quiz 675.
. 2006. Impaired virus-induced interferon-alpha2 release in adult asthmatic patients. Clin. Exp. Allergy 36: 331–337.
. 2002. Atopic phenotype in children is associated with decreased virus-induced interferon-alpha release. Int. Arch. Allergy Immunol. 127: 82–88.
. 2005. Dendritic cells in asthma: a function beyond sensitization. Clin. Exp. Allergy 35: 1125–1134.
. 2005. Respiratory viral infections and asthma pathogenesis: a critical role for dendritic cells? J. Clin. Virol. 34: 161–169.
. 2006. Recent progress in the biology of airway dendritic cells and implications for understanding the regulation of asthmatic inflammation. J. Allergy Clin. Immunol. 118: 331–336.
. 2003. Evidence for a differential expression of the FcepsilonRIgamma chain in dendritic cells of atopic and nonatopic donors. J. Clin. Invest. 111: 1047–1056.
. 2005. Compartmental imbalance and aberrant immune function of blood CD123+ (plasmacytoid) and CD11c+ (myeloid) dendritic cells in atopic dermatitis. J. Immunol. 174: 2396–2403.
. 2000. Immunobiology of dendritic cells. Annu. Rev. Immunol. 18: 767–811.
. 2002. Natural type I interferon-producing cells as a link between innate and adaptive immunity. Hum. Immunol. 63: 1126–1132. 2005. IPC: professional type 1 interferon-producing cells and plasmacytoid dendritic cell precursors. Annu. Rev. Immunol. 23: 275–306.
. 2000. Plasmacytoid dendritic cells activated by influenza virus and CD40L drive a potent TH1 polarization. Nat. Immunol. 1: 305–310.
. 2003. Human dendritic cell 1 and dendritic cell 2 subsets express FcepsilonRI: correlation with serum IgE and allergic asthma. J. Allergy Clin. Immunol. 112: 1132–1138.
. 2003. Unraveling the mission of FcepsilonRI on antigen-presenting cells. J. Allergy Clin. Immunol. 111: 38–44.
. 2004. Immunoglobulin E-bearing antigen-presenting cells in atopic dermatitis. Curr. Allergy Asthma Rep. 4: 263–269.
. 2000. Experimentally induced recruitment of plasmacytoid (CD123high) dendritic cells in human nasal allergy. J. Immunol. 165: 4062–4068.
. 2008. Human blood dendritic cells from allergic subjects have impaired capacity to produce interferon-alpha via Toll-like receptor 9. Clin. Exp. Allergy 38: 781–788.
. 1998. Fc epsilon receptor I on dendritic cells delivers IgE-bound multivalent antigens into a cathepsin S-dependent pathway of MHC class II presentation. J. Immunol. 161: 2731–2739.
. 2005. TLR9- and FcepsilonRI-mediated responses oppose one another in plasmacytoid dendritic cells by down-regulating receptor expression. J. Immunol. 175: 5724–5731. 2005. Viral infections, cytokine dysregulation and the origins of childhood asthma and allergic diseases. Pediatr. Infect. Dis. J. 24: S170–176, discussion S174–175.
. 2008. Toll-like receptor 9 suppression in plasmacytoid dendritic cells after IgE-dependent activation is mediated by autocrine TNF-alpha. J. Allergy Clin. Immunol. 121: 486–491.
. 2006. Plasmacytoid dendritic cell-specific receptor ILT7-Fc epsilonRI gamma inhibits Toll-like receptor-induced interferon production. J. Exp. Med. 203: 1399–1405.